IC's "Intern Superstar" Wins ABC News Contest! Written by 8/26/2008Share this story on Facebook! 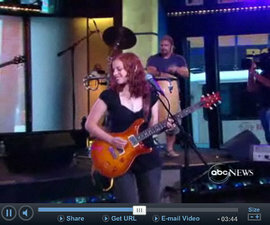 Revi Roza '09 and The Rozatones performing on "Good Morning America"
Watch as ABC's studio audience leaps to its feet as Revi Roza '09 wins Good Morning America Weekend's "Intern Superstar Challenge" and takes the stage to perform live with her band The Rozatones!